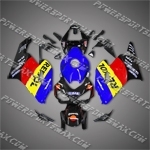 Honda CBR1000RR 04 05 Repsol Blue Fairing, Free Shipping! Used this engine on my pressure washer , no more wearing myself out trying to start it . Just a few modifications , and now I have a very useful machine . Works great!